Prime Minister of Ukraine Volodymyr Groysman will visit Ternopil region with a working visit on Tuesday, March 19. 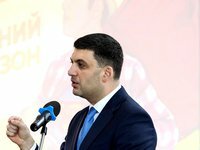 "On March 19, 2019, Prime Minister of Ukraine Volodymyr Groysman will visit Ternopil region with a working visit," the government portal said. The program of the trip is not specified.